Lunching with old friends at the last minute is awesome, but especially awesome when they're easy eaters. We split our usual bowl of congee and salt baked shredded squid with Ray and he added an order of snow pea leaves to the table. A perfect combination of calm congee, crack-like squid and the most delicious sauteed vegetable ever. 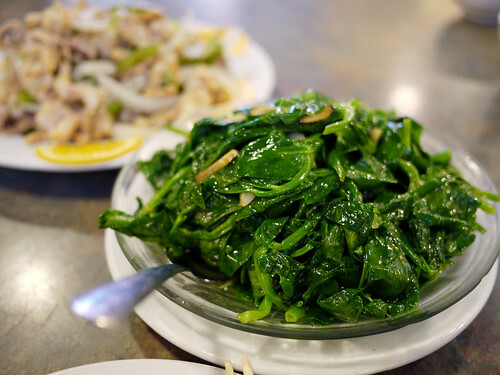 If you have never ordered sauteed snow pea leaves with garlic before, you ought to try. They are pricier than other sauteed veggies, but oh so worth it.